If memory serves, I’ve sworn off of reviewing vodkas a few times this year. And yet, here I am, reviewing a vodka as part of my year-end Dickensfest. Pau Maui Vodka is my pick for “Spirit of Christmas Present.” Why? The emergence of Hawaii’s distilled liquor trade has truly been a volcanic eruption. (pun intended) Not only is Hawaii cranking out world-class artisan Rum, but with Ocean, 808, Hawaiian, and Pau, the Vodka landscape has been forever altered. Hawaii is making great booze right now and in large enough quantities to be taken seriously. I made enough pokes at Ocean Vodka when I reviewed it to herein avoid similar jabs simply by Law of Averages. It must be said, however, that I’ve repeatedly stated that “vodkas really should come from Russia, Ukraine, or Poland.” Well, after Tito’s, Ocean, and now Pau, I’ll just stop saying that. 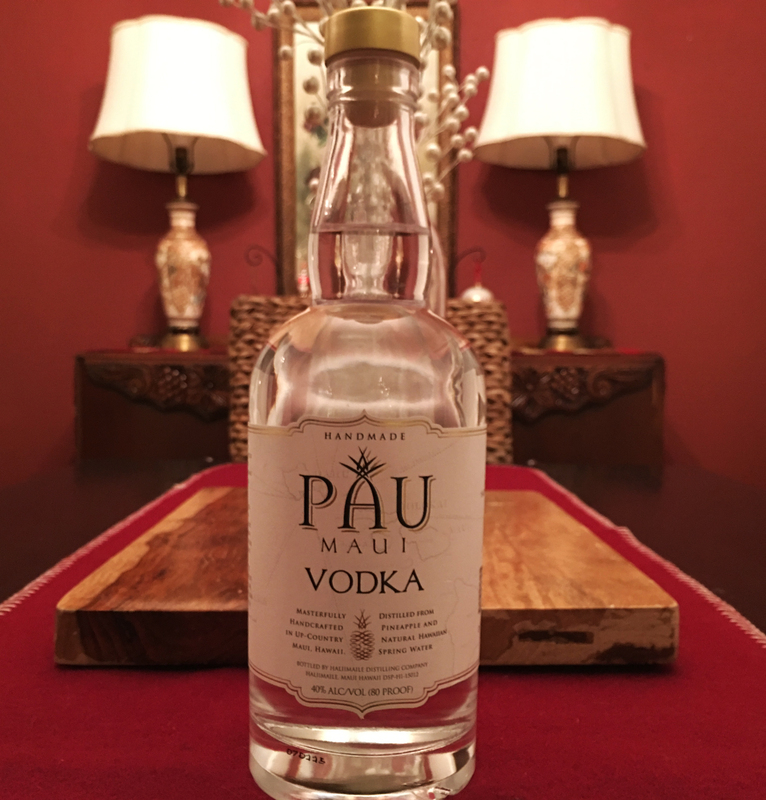 Smooth, clean, and light, Pau Maui Vodka is a top-shelf vodka and deserves respect. More expensive than Absolute, Tito’s, or Skyy, but cheaper than Ketle One or Grey Goose, Pau Maui Vodka has the distinction of outshining them all. Let’s take this from the top. Pau Maui Vodka is made from distilled pineapples and Hawaiian spring water. I could sit here for hours and regale the many virtues of Hawaiian spring water, but I’ll simply say: the water used to get vodka down to 80 proof is vital to its taste and mouthfeel. Pau has gotten this right. This is not a viscous vodka; rather, it’s light and refreshing. Pau is a very neutral vodka. However the master distiller managed it, he’s a genius. Because; while it’s made from pineapples, there is nearly no flavor in this bottle and no scent at all. Since the whole point of vodka is to be as water-like as possible, Pau is a success. I’m still flummoxed at how something made from pineapples could be this neutral and light. It’s not syrupy, it’s not sweet, it’s not floral nor fruity… Pau Maui Vodka is a neutral spirit at its best. The most flavor that I could imagine from this bottle is fresh strawberries… And that’s a stretch. No nose, no flavor… on to the finish. Medium length, warm, and clean, Pau‘s light finish means it’s not thick, it’s not viscous, it’s not oily; it does not cling to your palate, rather it fades away and leaves no trace. Pau has gotten this right. As I noted with the last Hawaiian vodka, Pau Maui Vodka is also not a polite drink. You could sip this for hours, completely unaware of how drunk you are. Only to be shown how completely wasted you really are when try to stand or walk or talk. As vodkas go, Pau Maui Vodka is executed beautifully. It’s a remarkable vodka. Yes, I’m throwing around superlatives again. While the word “pau” means “finished” or “done” in Hawaiian, I am not done with this vodka!